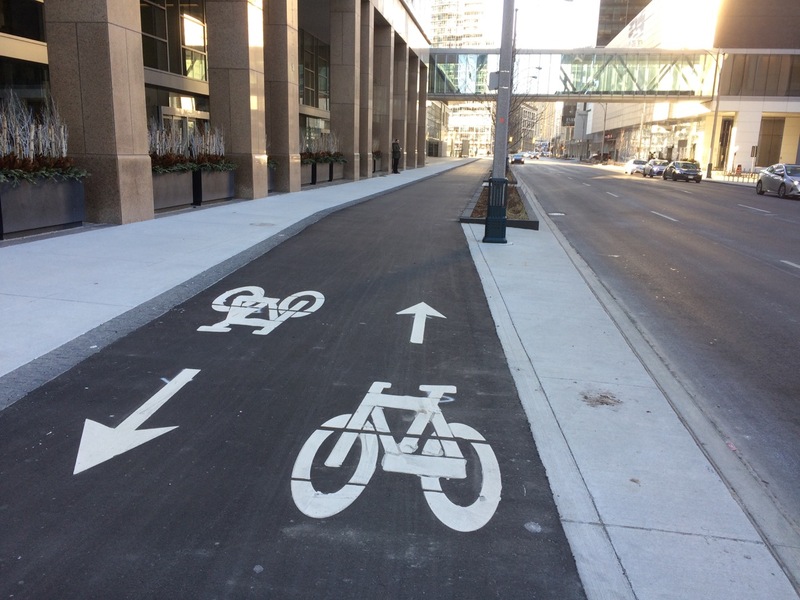 Almost three years ago the City of Calgary decided to install a grid of cycle tracks and bike lanes in its downtown core. Since then the number of people cycling has increased by about 40% and more women and children are using bikes to get around. That inspired Edmonton to install its own minimum grid of bike lanes. Meanwhile, New York City last year recorded the fewest traffic deaths in more than a century. This was thanks in large part to implementing a Vision Zero plan, which included lowering speed limits on most streets to 25 mph (40 km/h). Here in Toronto we had more cycling deaths last year than in any year since 1998. Speed kills. Bike lanes make streets safer. These things we know. Yet, in 2018 only (literally) a few new bike lanes around York University and some in the Thorncliffe and Flemingdon Park neighbourhoods were installed and in all cases, the lanes don’t have connections on arterial routes, or to other bike lanes, or, well, destinations. No new bike lanes were installed downtown last year except for a short, well-constructed two-way bike lane on Harbour and Lake Shore (pictured above). And, it doesn’t look like we will fare much better in 2019.
and a bike lane on Willowdale Avenue from Empress to Finch Avenue. And, of course, we must discuss the elephant in the room. Bloor, Bloor wherefore art thou Bloor bike lanes? Now that 2018 has passed and no action seems to have been taken regarding extending the Bloor bike lanes we were curious about when the corridor studies or EAs would begin – and end. Meanwhile, councillors along Bloor and Danforth have publicly supported the bike lanes and would like to see them installed. Perhaps the City should hire the Urban Repair Squad that used to do guerrilla bike lanes in Toronto to install all the sharrows they call ‘connectors’ throughout the city so that official City transportation planning staff can be freed up to plan and install bike lanes -- at a much more rapid pace. We deserve better Toronto. We have the cyclists, we just need the infrastructure -- the bike lanes. And, apparently, for that we need coordination and political will. Time to stop making bike lanes so damn political and instead seeing them as what they really are: critical.